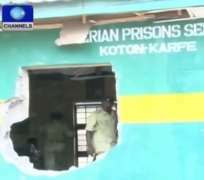 A prison break occurred at the Koton Karfe Medium Security Prison in Kogi State in which inmates were said to have broken their cells and escaped through the fence. Three of the 13 are convicts. The incident occurred at about 7.10am on Saturday. The inmates at the new prison site broke the wall of the parameter fence and escaped into the bush. Governor Yahaya Bello in the company of the Commissioner of Police and some political office holders were at the Koton-Karfe prison to see things for himself, but was denied access to the prison yard as there was no prison official to take him round. The officer in charge of the prison, Kosso Lawal, was said to have left before the Governor's arrival. Bello was received and briefed by his Special Adviser on Security, Jerry Omodara, who was already at the prison. Some of the information available to Governor Bello was that the welfare officer of the prison allowed the inmates access to their phones and this enabled them to communicate with their family members and gangs outside. It was also reported that military men who were deployed to the prison yard to guard it were not allow to go inside, their beds and property are kept outside where they sleep. A prisons officials said that this is one of the rules guiding the prisons that only their officials are allowed in. Governor Bello was was displeased and had to put a call across to the Kogi State Prison Controller, Musa Yahaya Maza, who was said to be at home in Lokoja. The Kogi State Governor, Bello Yahaya, has called on the federal government to investigate the incident. While addressing pressmen, he said it was a conspiracy involving some prison officials and promised to get to the bottom of the incident. He told the officials to arrest the escapee inmates or risk losing their jobs. - Channels.